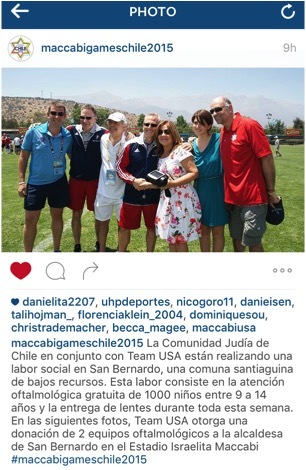 There are so many wonderful things that we are seeing and experiencing in Santiago at the Pan American Maccabi Games, including but not limited to hundreds of athletes trading shirts and pins at the Estadio Israelita Maccabi (EIM), great athletic feats, and Team USA giving back to the Chilean community. A Juniors Basketball player sunk two free throws with no time left on the clock to send his team to overtime, in soccer I saw a goal scored in the 90th minute for a much needed victory, and that doesn’t even mention all of the hard fought tennis and table tennis matches I witnessed that were truly captivating. What intrigues me most is what we don’t see, the hard work that goes on behind the scenes. The Chilean Organizing Committee has worked so hard to overcome the challenges of food and transportation at such a large event like this. Trust me, this is no easy task. What also goes unnoticed is the work of our volunteers in conjunction with our staff to make this a wonderful experience. Lou Moyerman, the Chairman of our Organizing Committee for these Games, put in countless hours working through the many details of the trip, along with Shane Carr and the group of dedicated employees in our Philadelphia headquarters. Lou had a vision to replicate the Tzedakah projects we undertake in Israel during the Maccabiah Games through our Lev L´Lev (Heart to Heart) programs. In March of 2015, we embarked on a mission to Cuba to visit the Jewish community in Havana. Subsequently, we raised enough money to help get the Cuban delegation to Chile for these Games. It was truly heartwarming to see them march in during the Opening Ceremony. While here in Santiago, we are engaged with three programs so that our Maccabi experience continues to be about more than just sports. Team USA is putting together food parcels for the poor within the Jewish community, which you all so generously helped fund through donations. Many athletes are visiting a cancer ward for children and putting on a sports demonstration for them, and finally, through the leadership of Dr. Marc Backal, Team USA is providing eye exams and eyeglasses for the poor of Santiago. Throughout our time in Santiago, our teams have been traveling to a day care center in the San Bernardo neighborhood of Chile. The center was in terrible condition, as they ran out of the funds needed to complete the building. When the local government heard of Maccabi USA helping out, they stepped in and offered to complete the construction. How incredible! You never know what the impact of the work that people like Lou, Marc and our team can do, yet our footprint has made a lasting impression. Through the efforts of Marc and the Team USA Medical Team, they have raised enough funds to purchase the machines they were using so that they can leave them in Chile for future exams. 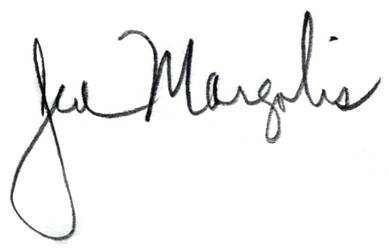 Lou's vision helped bring better eye care to many. 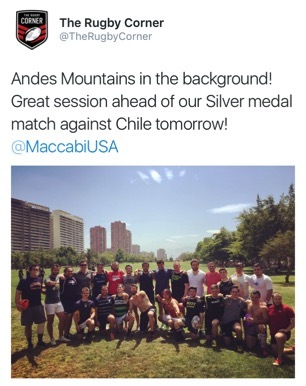 Kol hakavod, all the honor to our athletes and leadership for making a difference. Today's competitions: We did not have any competitions today, as we were observing Shabbat. Click HERE to see Team USA's schedule for tomorrow, January 3, which includes matches for the following teams: Juniors Boys' Basketball, Open Men's Basketball, Masters Men's 45+ Basketball, Open Women's Beach Volleyball, Futsal, Field Hockey, Rugby, Juniors Boys' Soccer, Youth Men's Soccer, Open Women's/Men's Soccer, Masters Men's 35+/45+ Soccer & Open Women's/Men's Volleyball!